Green is probably my favorite color, simply because it seems to go with everything. I treat it like a neutral. The possibilities are endless when decorating with green. There are so many different shades and green compliments every other hue as well. Except blue. I was always taught that green does not go with blue. Apparently that's not true! The blue sofa really pops against the chartreuse green walls, painted with Benjamin Moore's "Oregano." Chartreuse green walls again. 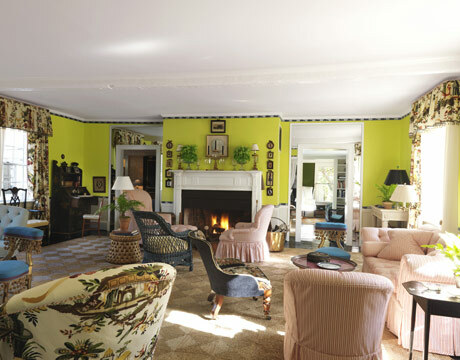 Jeffrey Bilhuber used Benjamin Moore's "Chic Lime" color, making the soft pink slipcovers pop. 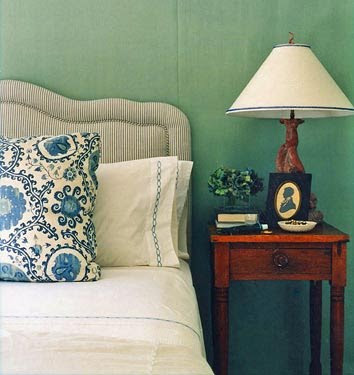 Thinking about how we have used green in the past in our decor, I am reminded of "sea foam green" from the 80's. The wall above shows how sea foam green evolved into this grayed down green. Like sage green. 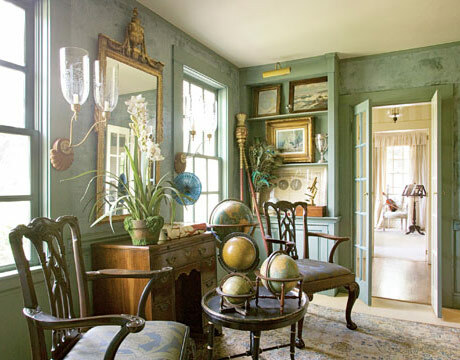 The soft sage green walls look patinaed which compliments the antiques in the room. Then there is the fresh, crisp color, kelly green. 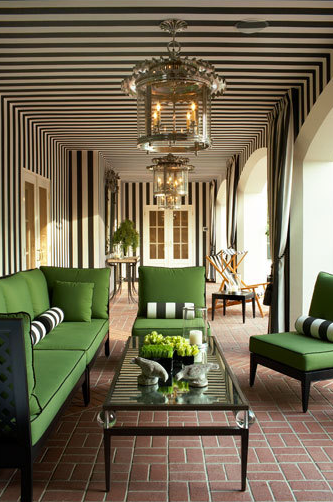 I love how the green sofa fabric works with the black and white stripe walls on this loggia. 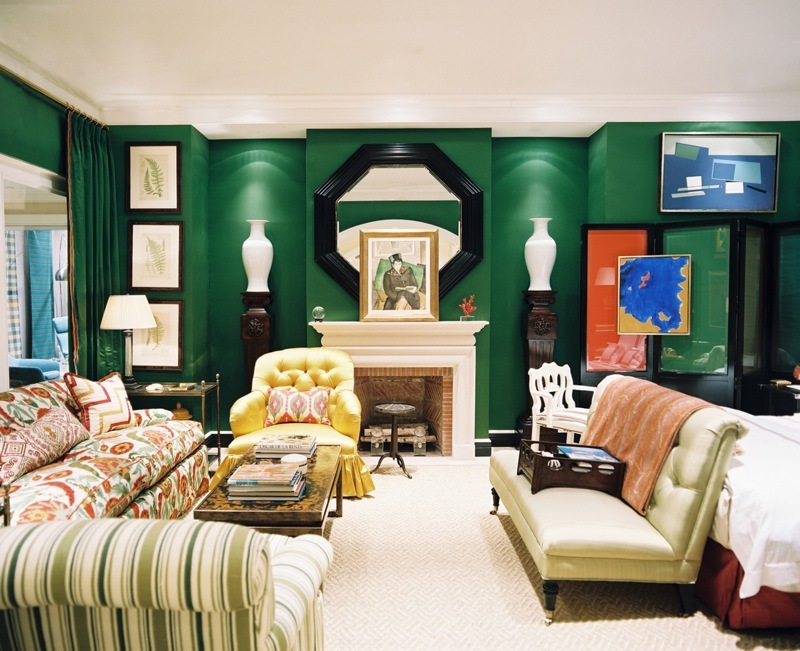 And I love the lacquered green walls in this living room! Green looks fabulous with orange, don't you think? More green with black. The crisp black and white photos are perfect on this wall, painted with Farrow and Ball's "Minister Green." 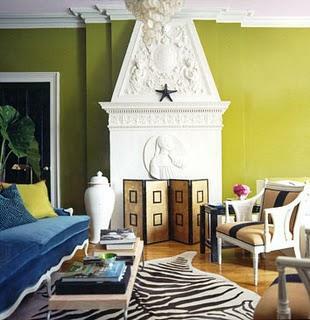 Green gives this room a fun and playful feel with the painted mantel and patterned sofa. Notice how it looks with yellow, but also pink. The ceiling is pink and the sofa has pink trim. Are those pink hydrangeas on the chair fabric? 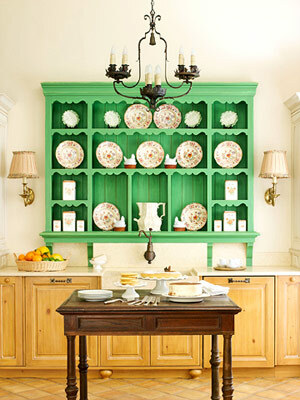 White ironstone and floral plates looks extra special on this green hutch. Speaking of plates, I'm loving this tablescape! Notice how all the green elements just pop on the pale blue and white tablecloth. I love the faux bois planter with succulents too. When Mr. A bought this hutch for my birthday a few years ago, it had a pale yellow interior, which I eventually painted green. Notice the green damask wallpaper too? I love using green in my decor as you can see. The entry is painted green, so it made sense to me to have it transition to the dining room with the green damask wallpaper. To me, our green entry says "welcome!" Remember Kermit the Frog? I can't forget his famous line, "It's not easy being green!" I think he was wrong! Green is very easy; easy to live with, easy on the eyes, and friendly to all the other hues too. Apple green is my all time favorite! Have you seen my apple green sofa...love the color so much I covered the whole thing with that color;)! Love all of the inspiration pics you shared...gorgeous...and of course I adore the green in your home! Your gorgeous dining room is saved to my favorites and your entry is just BEAUTIFUL! Iy is SOOOOO easy being green;)! You know I love green and have a lot of it in my house. There is may fav hutch again. Love your entry. I love your hutch and wallpaper! I have used more blue greens in the past but I actually have apple green accents in our living room and it feels happy. I agree 100%. Green goes with everything and all greens go together. Just look out the window at nature and see all the greens blending in harmony together. It's my favorite color and I've always decorated with it. Back many, many years ago (the 70's) I had the dreaded avocado appliances in my kitchen and I have to admit I even loved those! I totally agree with the fact that green is easy to live with, decorate with and it really does go well with blue.. blue sky, green grass. Loved your photos today.. what inspiring rooms and the table is great.. lovely ideas in each one. thanks for sharing. Oh, lovely snaps and I love seeing snaps of your lovely home! I love green too! My living and dining room are painted a soft green and I just love it. I was talking to my daughter last night about paint color. I've been looking for the perfect yellow to paint my guest bedroom/bath but I want it to go with the same color feel as the green I have in my living room, hall, master bedroom and bath. It's Grasslands by Kelly Moore. Beautiful!!!! I told her that I view green as a neutral!!! I love the green in your entry way. I love the green in your entry. 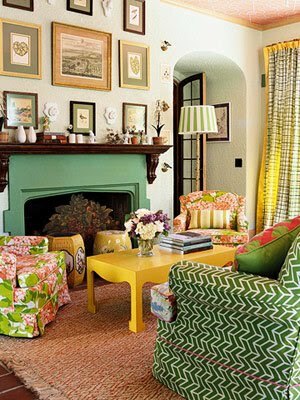 I have a couple of rooms painted green in my home too, and I use it as an accent color. I love the way yellow, green and red go together. Did you get my email? You won my giveaway. Email me you address and I will send the book right out! In love with your house, your style, your collections!!! It all says welcome, come in and stay awhile. Thank you for this blog ...always full of eye candy. It's a joy to come here. You are the first blog I check in the morning. In the beginning. . .I didn't care for green. "MR. ED" being an Army man gave way to seeing green everyday. Think it may have worked on me over the years. Talk about Kelly Green and Hunter Green, whew! I'm really dating myself! Our master is a soft sage green, the lower level family room a soft sage green and the exterior of our home is Thyme Green! I agree. . .it is an easy color to live with. Thanks for posting this enlightening look at green decor! I like the shade of green you used. It is very similar to what I used in a bedroom and 1/2 bath. really like that hutch. If you like toile, drop by as I am having a giveaway. I really like green too and agree that it is a very welcoming color. Our kitchen and dining room are SW Rye green. It is wonderful. In the home we are remodeling, I am trying out a gray blue called SW Samovar Silver but I plan to throw in a few green accent pieces to "freshen" things up and make the rooms cheery. exactly like my husband's grandparents Florida living room in 1975...I mean exactly. I am going to see if I can dig up a picture of that this weekend and email it to you. She had the stiped canopy over her windows too...very weird seeing that here. Where is the picture from, do you know? Love all the green...I could not agree more...I chose it as my favorite color at the age of 3 when my 5 year old sister pressured me to commit to a fav and after all these years it is still tops! Love your green walls! Green is my fave as well~ never thought to call it a neutral...but it is, isn't it? The animal print with the green = personality in a big way! Oh for some green around here.....outside in the garden! Such a long Winter but Spring will come. Meanwhile enjoying your beautiful greens in these images and of course your lovely home. Delores, If you have seen post on my home you know there are several shades of green on the walls. I love your hutch and the majolica plates. 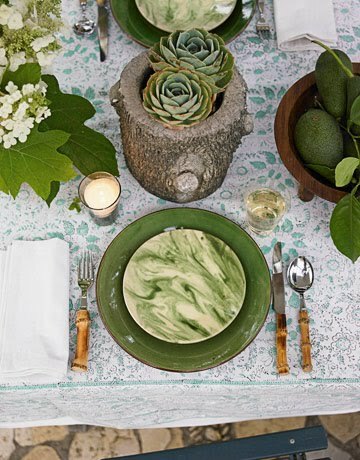 Such a great post Delores, full of wonderful examples of decorating with green! My son's room is painted a deep green and I love it! I also love getting a peek at your house, it's so pretty! My daughter just got a new home...it has lovely green walls. Great ideas to share with her. Sigh....such beautiful pictures. I too love green. In our last home our bedroom was green. Each time I look at the pictures, it makes me want to paint our new bedroom green as well. Yes! I remember when people use to say green and blue didn't go together. You proved them wrong. Loving your entry! I like to add green to most of my rooms too. Your home is lovely. I have a very good friend who would think it is Heavenly. She is googoo for green. She has it in every room. I love green too and really enjoyed your pictures! 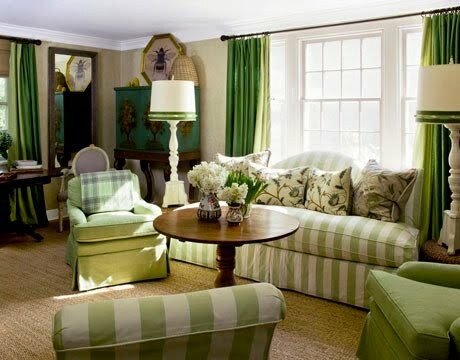 I am also a huge fan of green and at the risk of sounding like Jackie Kennedy we refer to our family room as the green room :). I love these kinds of posts and also featured a spring green last week. Last night's wpost was navy. Color rocks my world and it is always fun to see how others use it in their homes. I've always been a big fan of green...much to my Mother's chagrin! She was/is a blue person. The very best green I ever did was the dark, dark shiny green in the lavatory in our old house. With white ceilings and woodwork, it was spectacular! And now, instead of doing that same green, I've gone to BM "Mysterious"! Ah, delicious green! I always thought blue was my favorite colour until a few years ago when I realized I was painting so many walls in my house green! My living room, breakfast and kitchen colors are similar to the green in your entry. This year I painted my historic brick house green with purple & red trim, based on a colour scheme I found in Cottage Living. It is bold and wonderful. Every time I tell a client "green is a neutral, it goes with everything" their minds boggle until they realize I'm right. Lovin the green...(I think I goes with everything too). Your entry is lovely and your runner up the stairs...OMG! Love it! PS - forgot to mention, I have a GREEN sofa coming in soon. Cannot wait! And then there's the use of green at The Greenbrier....their green with pink is classic! Green makes me HAPPY! Love this post. I was thrilled to see the leopard carpet up the stairway in your gorgeous home. I am currently working on picking one for my entryway staircase. Is this Stanton carpet? Any chance you could share because this is 'spot on' as to the look I want. Thanks Delores! I'm thinking about purchasing some kitchen cabinets, antiqued green. I'm worried that they are too avocado. Dolores, you'd help me pick the perfect shade! My husband and I just moved into a new home with all white wals, and as it turns out we like color! i am a big fan of green but getting a little over whelmed by the diversity of hues. I Love the welcoming cheerful hues of your entry way and how you see Green as a neutral color. Would it be too much of an imposition to ask what brand/color type you used in your entry way? It feels so Right to me. looking forward to reading more on your pages. Best-- appreciative in Virginia. Just writing about decorating with "green plants" and why that's such a good idea. 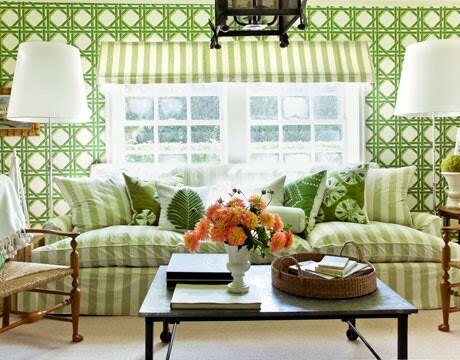 Your photos are an inspiration for decorating almost every room, and anything with green.